adpressed setose to glabrous above, strongly ridged, especially below. Leaves pinnatisect, the segments dentate in their lower part, setose above, and along the veins beneath. Inflorescence paniculate, the buds somewhat nodding, flowers and fruits erect. Buds ovoid-globose, 10-14 x7-10 mm, sparsely hispid-setose. Petals orange-red. Capsule very narrowly elliptic, 8-15 x 3-5 mn, strongly ribbed, obscurely torulose. Disc almost cylindrical, occasionally cylindric-conical. Fl. 7-8. Steppe, 1640-2000 m.
Type: Turkey B9 Bitlis, Tatvan to Ahlat, nr. Soğurt, 2000 m, slope in steppe, Davis & Polunin D. 24614 (holo. E!). Armenia & Kurdistan. B9 Bitlis: Nemrut Da., 2000 m, D. 23590! Muş: Patnos to Malazgirt, 1640 m, Hub.-Mor. 10931! Ağri: Ercis to Patnos, 1850 m, Hub.-Mor. 10932! N. Iraq; an Ir.-Tur. element related to P. fugax. 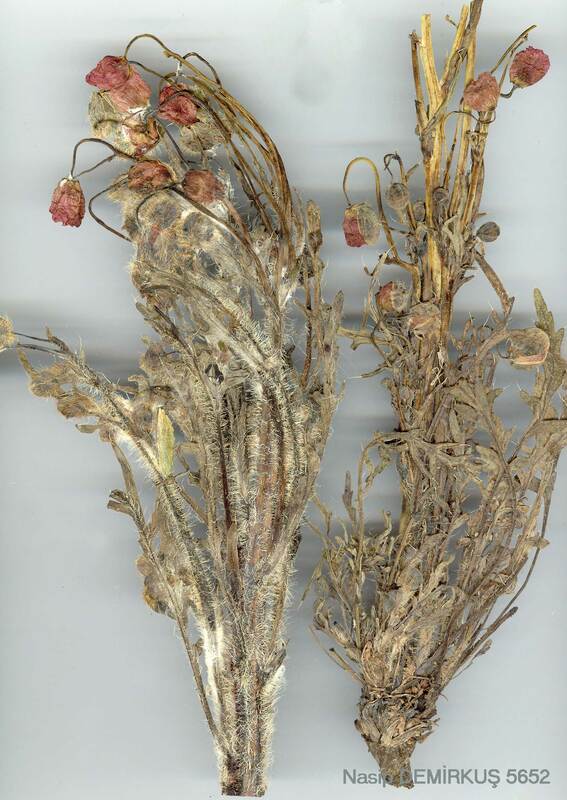 Of the specimens cited above, D. 23590 has sparsely setose capsules, whereas the other specimens have glabrous fruits.